Three Kingfishers were seen around the lake this morning (including one which was ringed), and a Yellow-legged Gull was in Heron's Green Bay. The last three autumns have been so wet that BW has been unable to get the mowers in to the lake margins, and as a result, the reeds in front of Stratford hide have grown higher and higher each year. Soon you won't be able to see anything at all! Compare this picture to one taken in autumn 2006 here. Notice the white fringe of water-crowfoot along the reed-edge. Two Goldeneye were on Herriott's Pool today; four Common Terns and a Barn Owl were also seen. A Little Egret and two Black-tailed Godwits were on Herriott's Pool this morning. Barn Owls have been in evidence at a couple of sites around the lake during the daytime in recent days - presumably with broods to feed. A brood of eight Shovelers was noteworthy, and the male Canvasback x Pochard has also reappeared. With well below average rainfall so far this summer, water levels have now dropped sufficiently to reveal some mud in places around the margins; Bernard King hide will be the first place to have any decent shoreline. A Brown Hare was at the ponds on Nunnery Point this morning. Juvenile Black-headed Gull - one of the first signs of 'autumn'! 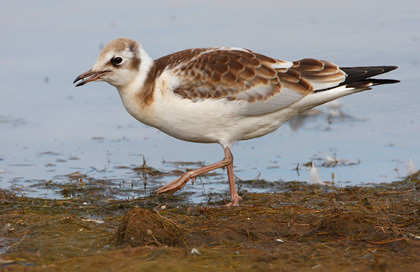 The two Black-tailed Godwits were still on Herriott's Pool, as was the first juvenile Black-headed Gull of the summer. Two Black-tailed Godwits were on Herriott's Pool today. There has been no further sign of the Red-veined Darter(s) at Nunnery Point since 4th, although there are still a number of Painted Ladies there, most of which are beginning to look a bit second-hand after their flight up from the south! A feature of this summer has been the appearance of vast mats of Fan-leaved Water-crowfoot in Stratford Bay; the area south of Stratford Islands is blanketed with white flowers. Most of Stratford Bay is also thick with submerged vegetation at the moment. A second-summer Mediterranean Gull was at Herriott's Pool this morning, with a Little Egret also there. A Cattle Egret seen this afternoon and evening was the first record for the lake. The male Ferruginous Duck was still in place on the island in front of Stratford hide today. Single Dunlin and Redshank were also reported. A Redshank was at the main dam today. A male Red-veined Darter was found on the pools at Nunnery Point this afternoon - a new addition to the surprisingly poor Chew dragonfly list. This has long been predicted to occur, most recently by me last night when I uploaded this month's homepage. Another new insect for Chew was Chimney Sweeper (right) - a dull day-flying moth which was found to be on the wing in large numbers at North Shore today. 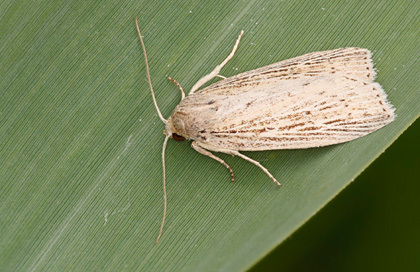 The only other record of this species in BANES was from the adjacent 1km square at Knowle Hill, many years ago. A Greenshank was at Heron's Green Bay this evening.